Build a fake hotel bed that is entirely hollow. Have it look like it's just a normal bed with sheets on the side and everything. Rig the sheets on a pulley system to rip in the center and pull off to the side. 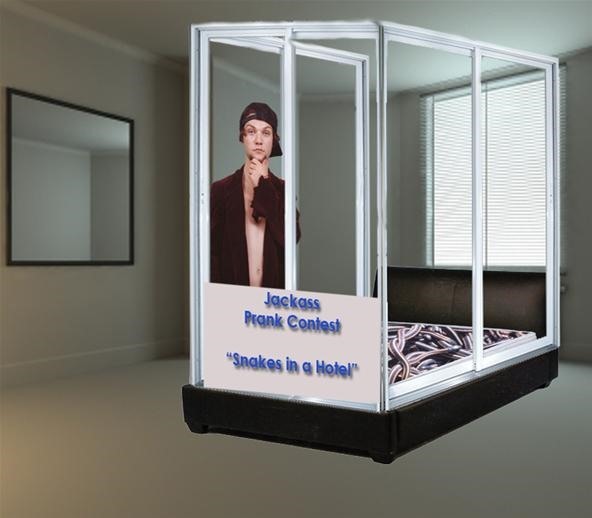 Create a fake prank for the contest winner so bam thinks that they are going to shoot a different prank the next day. Have someone push/tackle Bam onto the bed into the snake pit. The side of the bed will have plexi-glass pieces that can easily be pulled up creating a glass room for bam to be with the snakes in. If you want to go the extra mile you could drop a box of mice in there with him.